Looking for great prices on boat parts? WE GOT EM! Looking for fast same day shipping? WE GOT THAT TOO! Welcome to Outboard Ignition.com. We specialize in one purpose,... offering the largest selection of the best quality outboard boat motor ignition parts you can buy along with top notch service and knowledge of what we offer. Don't fall for the "Genuine OEM is better" routine. We offer a much superior "Made in USA" product with a longer warranty and for less! Remember back in the day when aftermarket parts were just a "cheap" knockoff of the original OEM parts? Today that is no longer the case. Actually it is exactly the opposite of yesteryears. That's why we stopped offering the overpriced OEM stuff for years now. While OEM outboard boat motor ignition parts are fair in quality, we offer an aftermarket brand of stator, power pack, switch box, trigger, timer base, coil, regulator, rectifier, wire harness, etc. 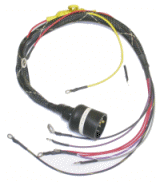 parts manufactured by CDI Electronics, which have redesigned their boat parts over the OEM counterparts and made them better. Actually, "better" is an understatement. Aftermarket manufacturers are not just duplicating the OEM anymore, they are fixing the OEM flaws to produce a much superior product to OEM. Read below to find out what we mean and why you should consider replacing your troubled outboard motor ignition parts with these parts instead of the less reliable OEM parts. Do you have an outboard boat motor with obsolete ignition parts? Original parts no longer available from the manufacturer? Well, you may be in luck to fix your older outboard motor via our "repair and return" option available in many "no longer available" situations. If you don't see your boat part listed in the store, e-mail us for availability of "repair and return" of your existing boat motor parts which also has excellent pricing. Several tests have been conducted which show that there is excessive heat generated in the outboard boat motor stator circuitry. This heat can be damaging if it not controlled. By removing the nylon (black epoxy) overcoat from the stator frame and coils like the OEM parts have, the heat can dissipate away from the stator windings much more efficiently. Also, the charge coils on some stators have been positioned differently in order to protect the sensitive capacitor charge coils which can be heat affected. All this means longer life and dependability, not to mention a generous 3 year warranty. You won't find this design improvement and warranty with OEM stators! Whether you have a Johnson Evinrude Mercury Mariner Yamaha Force or Chrysler outboard boat motor, we have a precision trigger/timer base that will provide many years of dependable service. You won't see the wiring insulation on these start to crack and crumble like OEM. CDI has also redesigned their triggers and timerbases over the OEM to provide quicker and easier starting. 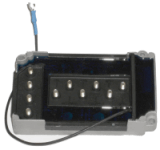 Manufactured with the same color coded wiring and connector configurations as OEM, installation is a breeze, and a 3 year warranty applies. Being one of the most common outboard boat motor ignition component failures, a power pack/switch box is usually in high demand. It is strongly advised that on some applications using two switch boxes, that you replace both at the same time. Outboard motor power packs/switchboxes containing a biased circuit are designed to prevent feedback which can damage other ignition components. Yep, these components are also better manufactured and have a 3 year warranty. Outboard motor coils are many times replaced unnecessarily. Always check your other boat motor ignition parts before just assuming you have a bad coil. Most common signs of a bad coil are when the housing is cracked or allows leakage around the plug wire. As a bonus, most of our coils are supplied with a new high quality plug wire for years of lasting service. The charging components of your outboard boat motor are very important to make sure you don't get stuck with a dead battery. These new parts are made to withstand the most demanding conditions with added accessories by containing an internal fusible link to reduce the probability of fire damage commonly caused by a shorted red hot regulator. The boater does need to be aware though that a particular motor is only designed to provide so much charge output, and putting a big strain (excessive boat accessories) on a small system is not advised. Tip: Water cooled regulators obviously require adequate water supply to be cooled. Make sure your water pump is in good condition at all times to help prevent regulator/rectifier failure, or even more dangerous, a fire. Tired of taping and splicing those rotting crumbling wires of your outboard boat motor harness? Anyone having an older outboard motor has probably dealt with this situation on many occasions. Along with being color coded, these new harnesses are easy to install, will resist the urge to crumble away, and you can put your rolls of electrical tape away for good. Same quality harnesses are available for most applications to replace your control box to motor wiring as well. We carry a full line of outboard motor ignition switches for Johnson Evinrude Mercury Force and Yamaha. These ignition switches are direct replacements for both control box and/or dash mount applications. All ignition switches come with two keys so you can always have a spare in case one is lost or gets broken.